Shetland Sheepdogs have been among the most successful breeds in all performance events in which they are eligible to compete. Shetland Sheepdogs boast one of the highest number of obedience-titled dogs of any breed, have among the highest number of dogs with herding titles, and include many high-level agility and tracking achievers. Shelties have won top honors at a variety of significant national events such as the Gaines Obedience competitions and the USDAA Pedigree Grand Prix of Dog Agility. 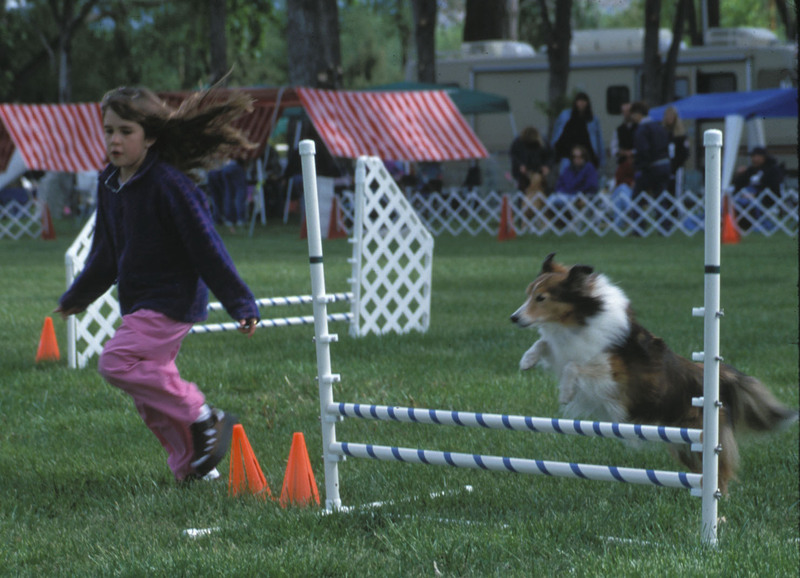 Sheltie clearing an agility jump. Photo by Judith Strom. Why is this? It undoubtedly stems in part from the Sheltie’s ancestral background as an all-around farm dog, guardian, and loving companion. They are intelligent and desire to bond with their owners. Their psychology is different from dogs such as terriers, which have been bred to be bold and independent. Shelties accomplish tasks with their owners. What Makes a Good Performance Sheltie? A good performance Sheltie likes to work, is easy to motivate with food or toys, and is mentally sound with the ability to focus on the job at hand. He is neither excessively sensitive to, nor distracted by, environmental conditions such as loud noises when he is working. Sheltie belonging to Joanne Carriera holds an obedience dumbbell. A dog with good working ability is intelligent and grasps training quickly. He also needs a high pack drive (the desire to be with and work with his handler) and a willingness to please. Performance events require a high energy level and a Sheltie that wants to be physically and mentally active. Physically, the dog must be healthy and sound, with good eyesight and hearing, correct structure, and freedom from genetic problems such as hip dysplasia. 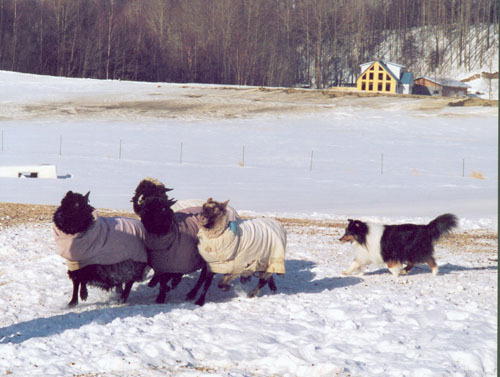 The breed standard for the Shetland Sheepdog calls for structure appropriate for a working dog. If your Sheltie is structurally correct according to the Standard, he should be capable of a high level of performance. Many Shelties will naturally watch their handler, and may be more difficult to train for jobs that require them to work independently. The first champion of any breed to be named the nation’s top obedience dog was a Shetland Sheepdog, Ch Wee Lassie of Eve-Bart, UD, owned by Mr. and Mrs. Dan Kerns of Pennsylvania. The year was 1970. Since then Shelties have set many records and had many, many achievements in performance events. The first Ch. OTCh Sheltie was Scotchguard Champaigne in 1978. She was owned by Susan Hoelzle. The first Sheltie to win the AKC National Obedience Invitational Tournament was OTCH Malcolm MacDuff, UDX, in 1996. He was owned by Richard Pisani. 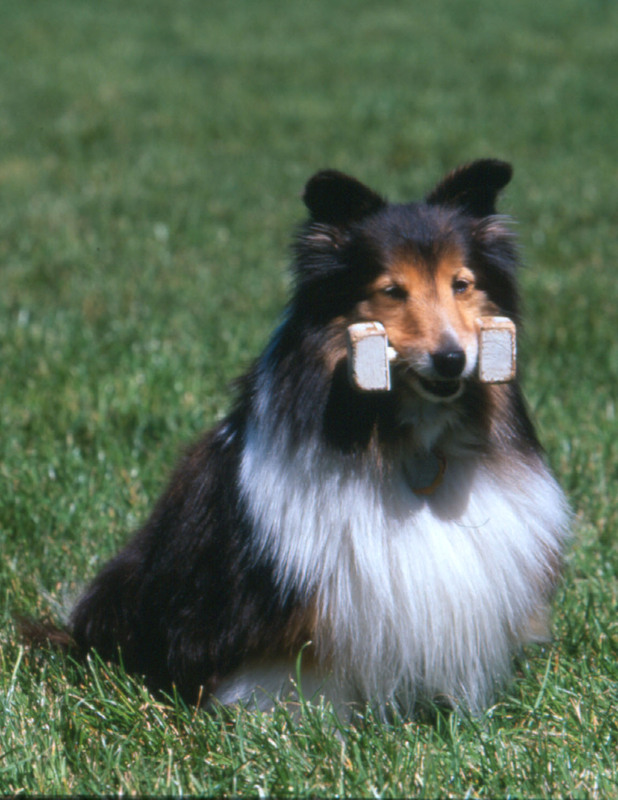 The first Sheltie in the U.S. to achieve herding trial fame was Am. Can. Ch. Markrisdo’s B.A.’s Patt’chez, a tricolor dog owned and trained by Charles Bruce. Patt’chez won the American Sheep Trial Club of Oregon four consecutive years in 1966 through 1969. In 1996, Dr. J’s Rocket Scientist, MX, owned by J. Ostrowski, became the first Sheltie to earn the MX title. In that same year, Shelties earned the highest number of AKC agility titles at all levels, of any breed. Also in 1996, Dixie’s Delta dawn, CD, AX, was the overall National Champion at the first ever AKC National Agility Championship competition. In 1997, Debbie Brink’s Shawna Dal Shar Amber, Am. Can. CD, MAD, FMCh. Onyx, became the first Sheltie to be inducted into the North American Flyball Association (NAFA) Hall of Fame. This is an honor bestowed on two dogs each year, on the basis of how long the dog has participated in the sport, his reputation and contribution to the team. The first Sheltie ever to earn a tracking dog title was Sea Isle Little Tinker, UDT, owned by Howard G. Langdon and trained and handled by Carolyn Langdon. Tinker earned his TD on November 19, 1950. Am. Can Ch. Delamantha’s Sunny Day Am. Can. UDTX, was the first champion Sheltie to earn a TDX, in 1977. The first Sheltie to earn the VCX (Versatility Certificate Excellent) was Ch. Westwind Word of Honor, UDTX, HS, VCX, in 1993. He was owned and trained by Rita Carr. Herding, Alaska style. Dog owned by Peggy Crawford. Shetland Sheepdogs have won titles too numerous to mention, keeping the tradition of being one of the top breeds in performance events. An overview of the history of Shelties in performance and an introduction to many of the basics of selecting, training, or breeding a top performance Sheltie can be found in Shetland Sheepdogs at Work by Joanne Carriera. This entry was posted in Performance and tagged first VCX Sheltie, Obedience titled Shelties, Patt'chez, qualities of a performance dog, Shelties in performance events, Shetland Sheepdog performance records, shetland sheepdogs in agility, Shetland Sheepdogs in Obedience, working Shelties. Bookmark the permalink.